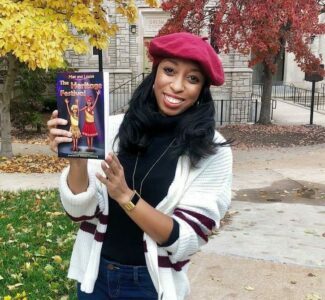 Cydni Robertson, Mizzou alum and first year doctoral student in Textile and Apparel Management, can now add published author to her CV after publishing her first children’s book “Mae & Louise: The Heritage Festival.” Just in time for Black History Month the story of Mae and Louise was inspired by Robertson’s own experiences that helped her overcome stage fright. “I was inspired to write Mae and Louise from my experiences delivering oratorical speeches, reciting poems, and performing in plays at school and church growing up. Learning to overcome any form of stage fright while developing presence and practicing diction and enunciation was a large part of my childhood,” Robertson explains. Her journey to Mizzou began as an undergraduate and continues today as a doctoral student studying education and its impact on women’s empowerment within the global textile supply chain. “I came here for undergrad while touring colleges in Missouri and fell in love. I was then invited back to speak at the TAM Young Alumni event, which led to another invitation to pursue my doctorate here. The Textile and Apparel Management department’s program was so welcoming that I decided to come back for my PhD, due to the support from my advisors and peers,” says Robertson. Robertson credits her mentors for guiding her throughout the doctoral program and supporting her academic growth. “Dr. Jung-Ha Brookshire, Dr. Jaime Mestres, and Kerri McBee-Black have all been a part of my personal and professional growth journey. Each of them has been great mentors and have an open-door policy that continues to guide me through my academic program,” says Robertson. 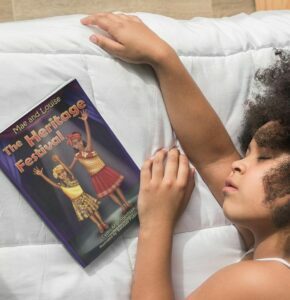 It is also the same guidance that her book, “Mae and Louise” offers children through the story of two sisters who learn how to balance between confidence and preparation as they recite a poem for their school’s Heritage Festival. And it is a children’s story that Robertson will continue using as a tool for children’s literacy and to feed her passion for writing in between her studies. “I hope to develop a children’s book podcast with stories that reflect girl protagonists from all over the world. The purpose will be to encourage the listeners to appreciate other cultures while recognizing the bravery in being a girl all over the world,” she says. Besides becoming a children’s author in between teaching classes and her studies, Robertson says the opportunity to study abroad has been most significant in her time at Mizzou thus far. “Being able to pursue a PhD has been significant within itself. I’ve most enjoyed my opportunities to study abroad here and complete experiential learning tours in Peru, El Salvador, and New York,” she says. Robertson not only intends to continue writing books or doing some form of work in children’s literacy/literature but she also hopes to become an assistant professor at a research intensive university and possibly someday go into administration. But she adamantly says, “I hope to never stop writing children’s stories. Even if I don’t publish all of them, I’ll likely be writing children’s stories for as long as I am alive”. To learn more about the story of Mae and Louise, be sure to visit the facebook page at here or purchase a copy of the book just in time for Black History Month here.